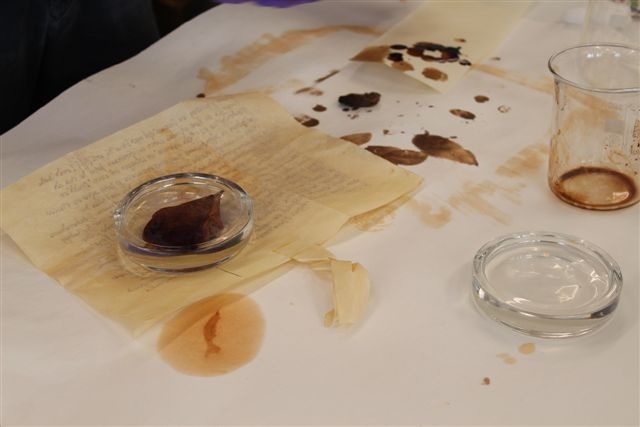 Paper is one of the materials that our Conservators work with most frequently at ERO. Damaged paper can be repaired by hand, but when there is a large batch to process our Conservators will often use a machine called a leafcaster, which fills holes and tears in paper with fresh paper pulp. On Saturday 6 July 2013 we are hosting a special one-day conference on Essex’s Industrial Archaeology. David Alderton: Why Industrial Archaeology? You can find out more about some of our speakers and their talks here. Tickets are just £15 which includes refreshments and a buffet lunch. 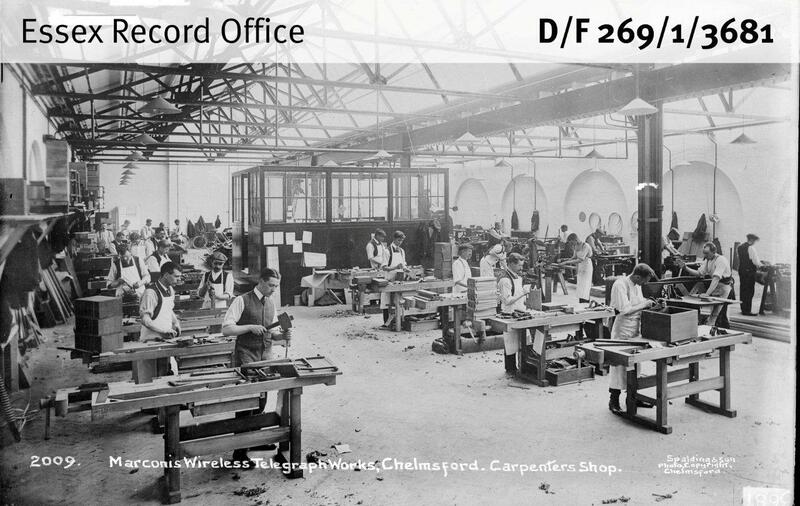 In the run up to the conference, we will be bringing you some industrial treasures from our collections to show you some aspects of Essex’s (sometimes surprising) industrial past, beginning with a sample of photographs from our collection of Marconi’s famous New Street factory, taken by Fred Spalding soon after its opening in 1912. Professor Roy Simons OBE will be discussing the history of this famous company at the conference. Professor Simons is a Marconi veteran himself – he began working on radar systems for the company in 1943 – and since his retirement he has researched the early history of Marconi’s. 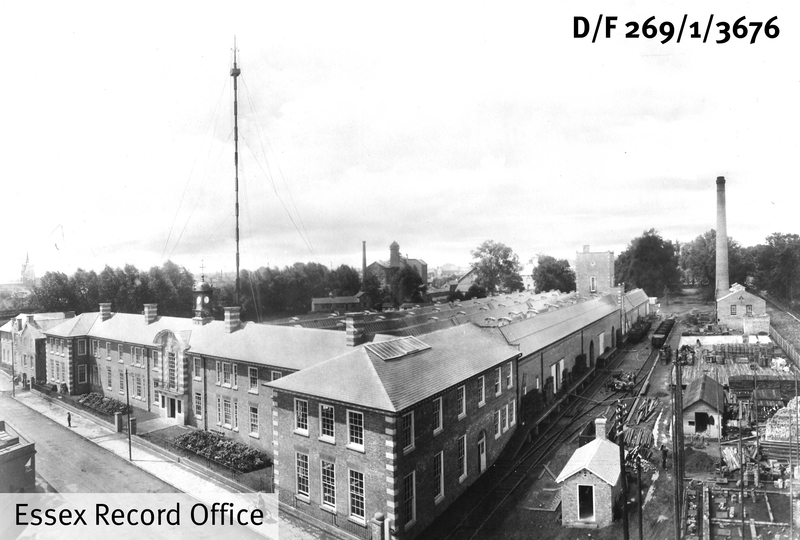 We will also be showing archive footage of Marconi’s factory shot in 1934, where you can see some of the photographs below brought to life. Guglielmo Marconi – the ‘father of wireless’ – was an extraordinary man, and Chelmsford owes much to him and the companies he established. 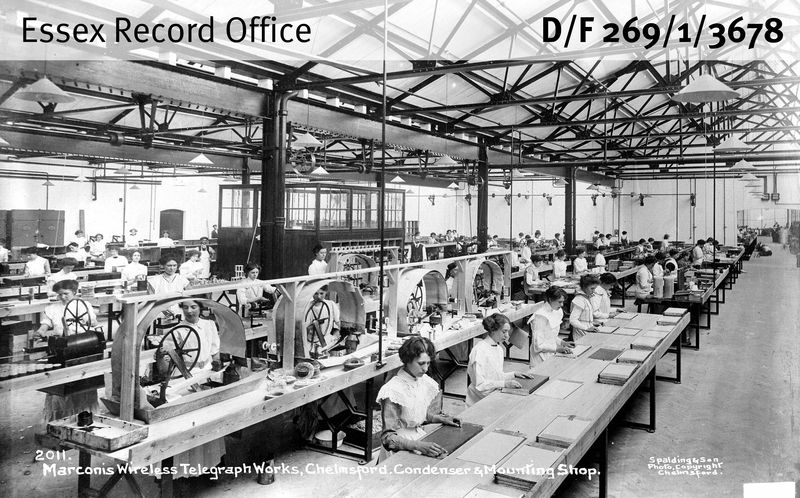 Marconi established the world’s first wireless factory in Hall Street in Chelmsford in 1898, but by 1912 demand for the equipment manufactured there had grown so much that the company moved to new purpose-built premises in New Street. 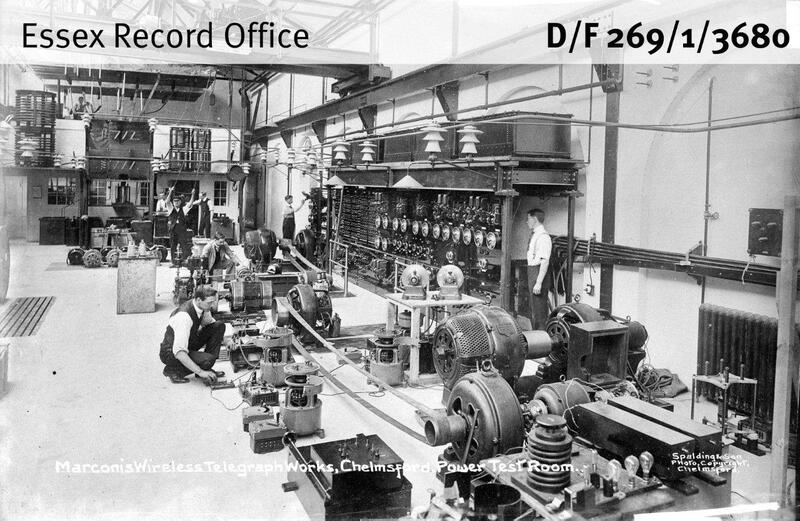 Marconi wireless equipment was used to broadcast distress signals from the Titanic, and the first publicised entertainment radio broadcast came from the New Street factory in 1920, when the famous Dame Nellie Melba sang. 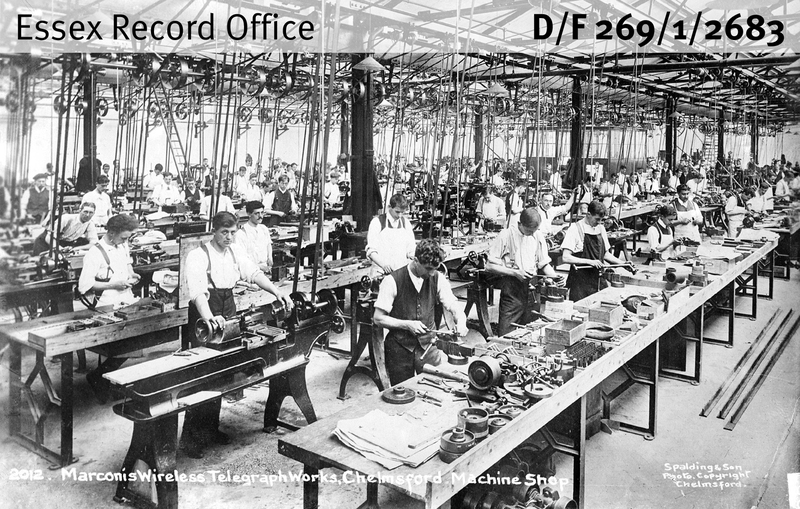 The company continued to improve on voice transmissions, and later became involved in the development of television. Marconi’s also played a crucial role in developing radar, which was critical to Allied victory in the Second World War. The New Street site has now been unused for a number of years, and after much discussion is currently being redeveloped. This letter relates to William Palmer who was condemned to death for sheep stealing in 1819. He was the husband of Hannah Noakes Reeve, my gt gt gt grandmother but not (so far as we know) the father of Joseph, her firstborn, my gt gt grandfather. William’s death left Hannah with a young son and baby, plus the six children from his first marriage. Although Thomas Gardiner Bramston (MP) sent a letter appealing to Mr Justice Bayley for clemency, the death penalty was upheld. I often wonder how Hannah managed during the year following his death and what happened to William’s children. She did remarry but died in 1824 at the age of thirty. In his letter, Mr Justice Bayley asked T.G. Bramston if he could think of any special grounds for clemency but none were forthcoming. The crime was not a violent one but, because of his occupation as a butcher (with the means to get rid of the evidence) it was felt an example should be made of him. The death penalty was a harsh one for a man with eight children but perhaps transportation would have left Hannah in worse circumstances as, even after a short sentence, he might not have returned home and she would have been unable to remarry. 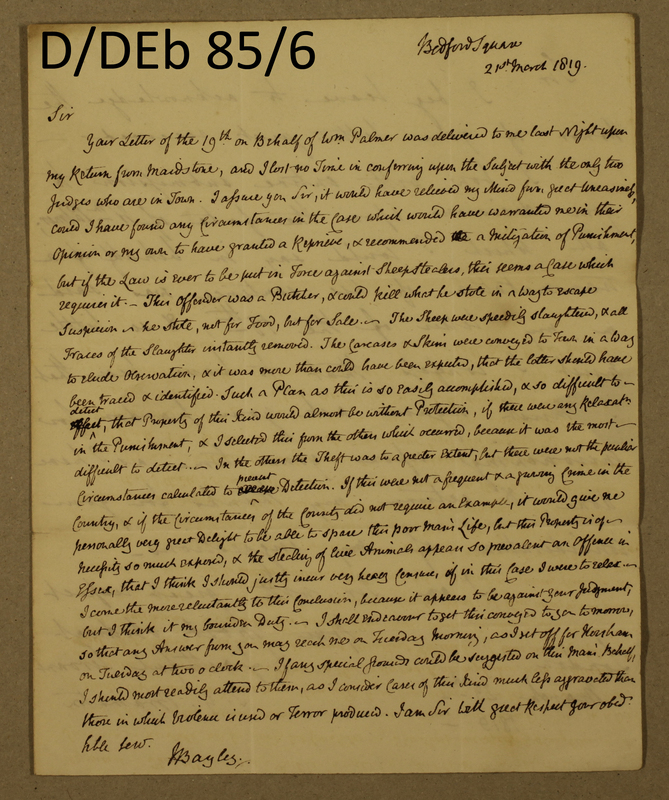 The letter from Mr Justice Bayley discusses why it was decided to make an example of William Palmer by sentencing him to death for sheepstealing. As a butcher, he was able to easily conceal his crimes, and had stolen for sale rather than for food. Bayley discusses the problem of sheepstealing in Essex and the need to deter others, even though Bayley wrote that ‘it would have relieved my mind from great uneasiness, could I have found any Circumstances in the Case which would have warranted me … to have granted a Reprieve’. As part of our 75th anniversary celebrations this year, we recently asked you, our users, to nominate your favourite ERO documents. Thank you very much to those of you who have sent in nominations so far – today we bring you the first in a series of your favourites. Elizabeth was born in 1788, yet in this charming little photograph you feel you can touch her shawl, it is so clear. She produced 8 children, two of whom made their mark in Halstead – Robert Ellington (banker, farmer and proprietor of the gas works) and Lucy (founder and superintendent of the Halstead Industrial School). They were Quakers. 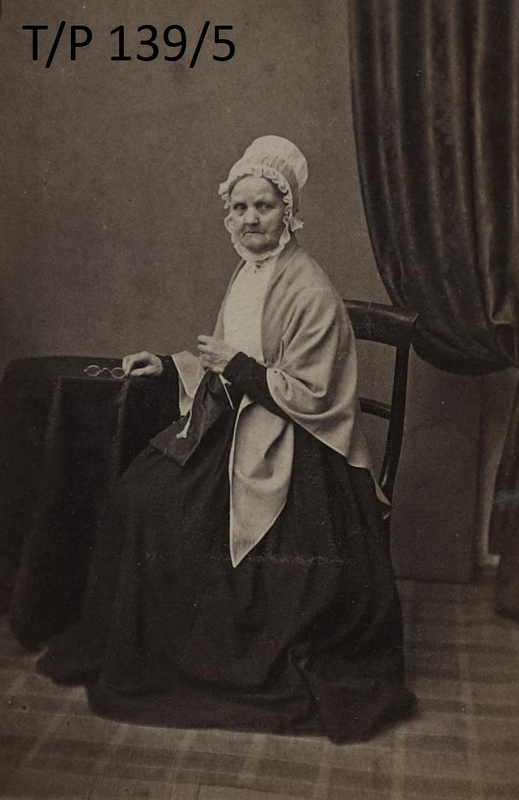 Thank you very much to Rosalind for nominating the photograph, we can see exactly what she means about the clarity of Elizabeth’s shawl, and how amazing it is to have a photograph of someone born in the eighteenth century. First of all, apologies for the break in transmission. We have been having some technical problems which our IT department is working on solving, and hopefully all will be back to normal soon. On 1 April this year we published news of a recent ‘discovery’ in our archives that showed that medieval Chelmsford had its own John Lewis department store. The document in question said that a man named John Lewis had bought some land in Chelmsford fronting the High Street to build ‘a big shop’. The text for the fake deed was constructed by Archivist Katharine Schofield, who specialises in medieval documents. She used her expertise to mimic the way in which medieval deeds were written, constructing it in both Latin and in English translation. The finished text was sent to our Conservation Studio, where Conservator Diane Taylor used her calligraphy skills to recreate the style in which a deed of this type would have been written. By the date of our forged deed (1405), however, English would have been much more commonly used and expressing something in Latin would have consequently been much more difficult. Field names do occur in deeds of this date (and earlier) and they are often obviously of a pre-Conquest origin. The land mentioned in this deed, ‘Le Backsydes’, is taken from the description of land on the Walker map of 1591. In our deed, the annual rent that John Lewis paid for his land was one chilli pepper on All Fools Day. Token rents were quite common in deeds of this date and applied to land that had been bought and sold as well as to land that was leased. Rents could be flowers, items of clothing such as gloves, pepper and wax. Some of these would be of a monetary value, others would not. Chilli peppers, however, are native to the America sand were not introduced to Europe until the end of the 15th century. Payment of rents was usually done on feast days, the most common in medieval deeds being Easter, Midsummer, Michaelmas and Christmas. Occasionally there were payments on feast days. However, All Fools Day is not a feast day. The witnesses in our deed were chosen from the names of founders of stores which now all trade as John Lewis round the country. A number had to be discarded as the Christian names were 19th century and would not work in Latin. There was, for example, a third Cole brother but his first name was Skelton. The land in question in our deed was being granted by the Bishop of London, who would have had his own men who would have been witnesses to his deeds and would not have necessarily had to call on men from outside his own diocese. Our witnesses from Watford and Chelsea may well have been called upon as they were part of the Diocese of London, but our witnesses from Reading and Windsor(part of the Diocese of Salisbury) and Cambridge and Norwich(Diocese of Ely) would not have been. We also gave our witnesses both first names and surnames and places of origin, but at this date witnesses were more often described by their first names only, e.g. Robert of Cambridge, or by a family relationship, e.g. Robert son of John. Since they would have been regular witnesses and known to the Bishop and his household no more accuracy was required. It is for this reason that medieval deeds usually conclude the list of witnesses with ‘et multis aliis’ (and many others). The deed was describing an act which had taken place, the transfer of land (hence it was written in the past tense) and the witnesses were people who would if called upon be prepared to bear witness to the transaction. It was unnecessary to list them in lengthy detail, it was sufficient to know that witnesses existed. The date of 1st April in 1263 was Easter Day. It is very unlikely that any deed would be dated on Easter Day. Both Sunday and Easter Day were too holy for business to be transacted on those days. Deeds are often dated before or after Easter and are often dated by the number of days from Easter. It is also rare for deeds of the 13th century to be precisely dated. Dates can often be deduced from other evidence and sometimes if the witnesses are well known.